Regular people can join a crew at sea to observe, document, learn and communicate about marine exploration and conservation on these expedition sailing trips. All trips stem from an ethos of conservation and education, whether adventure sailing, citizen science-based, or hard science with institutions. On the expedition vessel, Sea Dragon, professional leaders work alongside visiting crew as one team, providing valuable manpower, skills and financial support for the broader mission. While not all legs collect data, the conversation, lifestyle aboard and way of tourism is never separate from the broad term of marine conservation. Trips include formal scientific and conservation expeditions as well as adventure sailing voyages and occasional private charter. Many crew successfully fundraise the amount required to join an expedition, through friends and family or gaining local company sponsorship. Your contribution covers your board and also supports vital ongoing efforts in world marine conservation research. More trip dates & details below. Join exceptional sailing expeditions for typically 7-21 days’ duration. Sea Dragon is a 72ft (22m), 90,000lb displacement steel hulled sailing vessel built in the UK in 2000. Formerly known as CB 37, she is one of 11 second generation yachts built for the Global Challenge Race, designed to safely handle the world’s worst sailing conditions, and set up for volunteer crew with limited sailing experience. Accommodation for up to 12 guest passengers is a combination of sea berths and double bunks. There are two heads (toilets) with showers, a large well stocked galley, and a comfortable salon with seating for 14 people. Air conditioning makes life down below very pleasant in the tropics, while a drying room sorts out any wet clothes. A refrigerator and freezer keep the crew in fresh food for the duration of the voyage. The vessel is equipped with twin iridium satellite phones, HF radio, and all the modern navigation equipment to keep you safe and connected despite being well offshore. There is extensive on board medical capability and remote expert support through Medical Support Offshore. The boat is equipped for coastal exploration with two Avon inflatable boats and a scuba compressor with diving equipment. The boat is designed to support a full crew for months, can transit any of the world’s oceans and can travel to and operate in remote unsupported locations. As a research vessel, there is lab space, dissecting microscope, surface net trawling capability, and working deck space. With extensive sails, on-board fresh-water making, extended fuel reserves and almost 1kw of wind/solar power long-range unsupported journeys are substantially lower cost than traditionally shared research voyages on large motor vessels and ships. Work has included remote island surveys of conservation issues, diving and underwater video, offshore plastics sampling and collection, water quality monitoring and student educational trips. Pangaea Explorations works in partnership with several international organizations such as eXXpedition, Woods Hole Oceanographic Institution, 5 Gyres Institute as well as universities and research centres, in marine exploration, research, training and conservation to improve the world’s oceans’ water quality, health, marine life and access. They aim to inspire and develop a new generation of leaders in conservation science, communication, education, art and policy leadership, as well as providing informative and enjoyable ocean sailing expeditions to guest crew. Pangaea Explorations seeks out areas with higher than normal garbage loads, and counts on beaches and transects - trawls the sea with a fine net – to analyse volume and categorise the plastic contents. Plastic debris from our modern society accumulate on beaches and in great concentrations in the seas’ “gyres” - the centres of oceanic currents. The Sargasso Sea in the north Atlantic is the best known gyre, with a legendary ability to trap ships. Sea Dragon is working long-term with organisation ‘5-Gyres’ and their partners to document the amount of floating debris in our world’s oceans. Pangaea Explorations was founded by Emily Penn and Dr. Ron Ritter. Two British RYA Yachtmaster certified crew lead the boat and create a strong learning environment. Guests can see first-hand how high seas research, coastal conservation, education, marine filming and other work is done, build skills, and live a genuine adventure. Attitude, team skills and commitment are the important pre-requisites. 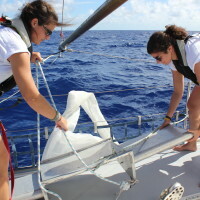 As a member of the crew, you are expected to join in all aspects of sailing and life aboard. You will be hands-on sail rigging, navigation, watches, route planning, weather analysis, radio communications, maintenance and all the basic duties of running an ocean sailing vessel. Prior sailing experience is helpful, but not required. For existing projects, Pangaea Explorations can provide a tailored cost-effective support solution to teams of up to 12 on extended journeys and a wide range of objectives, either exclusively, or opened up to paying visitor crew providing valuable support and finances for the work. Sea Dragon and her crew has been working hard for years sailing tens of thousands miles across 2 oceans, The Atlantic and The Pacific and 3 seas, Caribbean, Sargasso and Irish supporting important marine conservation work. They have completed scientific surveys of all these waters and the effect that this build up of waste in our waters has on our ecosystem. To actively strengthen the health of marine life through exploration, conservation and education work. To inspire and develop a new generation of leaders in conservation science, communication, education, art and policy leadership. Pangaea Explorations works on projects across many areas of marine conservation to protect the fundamental health of the world’s oceans which make up the biodiversity of 75% of the planet’s surface and ecosystem services. Our increasing world population and rise in living standards is pushing species to the brink of collapse. As the world’s production and consumption increase, so does chemical and debris pollution, plastics in particular, interrupting foraging and breeding, and destroying habitats. Chemical pollution and debris, from toxics to the famous ‘garbage gyres’ of the open sea. Water temperature changes and acidification due to increased atmospheric CO2 disrupting life-cycles in key marine species like corals. Sea level rise inundating and changing coastal habitat (and land based pollution/ debris). Over exploitation and destructive harvesting techniques, depressing natural populations. People eat fish which eat smaller fish which, along with other plants and animals at the bottom of the food chain, absorb toxic chemicals trickled into the environment from sources such as factories, farms, homes, cars and plastics from every country: Fish studies are thus relevant to environmental and human diet and consequences, including birth defects and toxicity in adults world over. Marine plastics threaten the existence of birds and wildlife, which are caught up by or killed by consumption. The scale of the problem is huge – one estimate is more than 70 million pounds of plastic are spread throughout the world’s gyres, with a million seabirds and 100,000 marine mammals die each year from getting tangled up in, and/or eating plastic. As Co2 in the planet’s atmosphere grows and is absorbed by the oceans, ocean acidification increases, damaging marine ecosystems and threatening species and food chains with likely extinctions. Co-founder Emily Penn was the youngest and only female recipient of Yachtmaster of the Year. Minimum age is usually 16 years. If you represent a group and would like to create a private trip, get in touch for a bespoke designed expedition! NB. The all-female eXXpedition trips are already over-subscribed for 2019. If you would like us to forward your name to be considered for future trips when released, please let us know via the enquiry form. Alternatively, please consider the trips below which are available. Join the team on a quick cross-border hop from San Diego, starting in Chula Vista Marina (1500-1700), to Ensenada, Mexico, before heading offshore to remote Guadalupe Island, world renowned as a Bisophere reserve and a major stomping ground of great white sharks, then back to Ensenada (depart boat 1500). This trip should feature relatively calm seas and coastal sailing, adventurous hiking ashore, and a chance to explore the remote island of Guadalupe with its dramatic cliffs and black sand beaches. Connections: San Diego International Airport (SAN) is about 20 minutes north of Chula Vista; Tijuana International Airport (TIJ) is about a 30 minute drive south: border crossings can be slow. It’s about a 70 minute drive from Ensenada back to TIJ, and 90-100 minutes back to SAN, exclusive of time waiting at the border. The classic Pacific crossing, following the sunset all the way from Ensenada (join the crew 1500-1700) to Ko’Olina Marina, Hawaii (disembark 0900)! You’ll have plenty of time to practice downwind sail handling, helming, and even some celestial navigation if you’re keen. It should be a spectacular ocean crossing with a focus on offshore passagemaking and sail training. After more than two weeks at sea, we’ll arrive in Oahu where the green hillsides rise up to the clouds from the sea and your senses will be re-introduced to land! This trip is an RYA Yachtmaster Ocean and IYT MOY Unlimited qualifying voyage – enquire to discuss. Connections: San Diego International Airport (SAN) is a 90 minute drive from Ensenada, but the border crossings can be slow. Tijuana International Airport (TIJ) is about a 70 minute drive. Honolulu International Airport (HNL) is about 30 minutes fron Ko’Olina, Hawaii. Focus: Offshore Passagemaking | Swimming & Snorkelling | Tropical Island Exploration | RYA Yachtmaster Ocean & IYT MOY Unlimited qualifying voyage: contact to discuss. Join the crew at Ko’Olina Marina in Oahu (1500 -1700). Upon departure, the backdrop of green mountain sides will slowly fade and give way to a 360-degree endless horizon. Spend few days of power reaching in the trades before negotiating the Intertropical Convergence Zone (ITCZ), known by sailors as the Doldrums or the calms - the area encircling Earth near the Equator, where the northeast and southeast trade winds converge. Squalls and unsettled weather abound, but the rewards for careful boat handling are beautiful sunsets, rainbows, and the satisfaction of sailing fast in tough conditions - and potentially dolphins, whales and endless sea birds. Enter the reef and anchor at Tabuaeran (Fanning), a gorgeous atoll of the nation of Kiribati. With 2 days and nights in the lagoon, snorkel over some of the best reefs in the world, see the fish, the surf, and the waters of Liz Clark’s “The Voyage of Swell” as well as take long walks on white sandy beaches, and visit the local community. End the trip with a quick overnight sail upwind to Kiritimati (Christmas) Island, with the largest land mass of any atoll in the world, hopefully greeted by the huge Manta Rays that cruise the anchorage off the copra pier. These islands are truly remote, and the best way to get to them is by sea - explore some of the Central Pacific’s gems before they’re gone :( Disembark Sea Dragon at Kiritimati Atoll and take the final dinghy trip ashore at 1200. NB. Kiritimati is on the same time zone as Hawaii, but 1 day ahead, so you will be departing the vessel on June 1 Hawaii time, but June 2 local time! Connections: Honolulu International Airport (HNL) is about a 30 minute drive from Ko’Olina, Hawaii. Fiji Airways has one flight a week to and from Kiritimati (CXI) – it departs Kiritimati the morning of June 3 (local)/June 2 (Hawaii). Numerous guest houses on Kiritimati can also arrange transportation to the airport. Recommendations on request. Kiritimati is on the same time zone as Hawaii, but 1 day ahead, so you will be joining the vessel on June 2 Hawaii time, but June 3 local time. Join the boat in Kiritimati Atoll around 1700: You’ll be picked up by dinghy and taken out to the boat. Depart Kiritimati and sail through the Intertropical Convergence Zone (ITCZ, “the Doldrums” - the area encircling Earth near the Equator, where the northeast and southeast trade winds converge) to Tabuaeran (Fanning), a remote atoll of Kiribati. Squalls and unsettled weather abound, but the region rewards careful boat handling with beautiful sunsets, rainbows, and the satisfaction of sailing fast in tough conditions. Keep an eye out for all types of life from manta rays to sharks to dolphins! The islands are truly remote, and the best way to get to them by sea. Explore some of the Central Pacific’s gems before they’re gone. After a few days exploring this spectacular remote atoll, depart for almost 1000 miles close fast, furious, and fun sailing through the Trades to the lush volcanic Hawaiian Island chain and the green mountains of Oahu. Fingers crossed we’ll be visited by dolphins, whales and endless sea birds! Disembark at 1500. Connections: Fiji Airways has one flight a week to and from Kiritimati (CXI) - it lands on Kiritimati in the afternoon of June 2 (Hawaii)/June 3 (local time). All transportation to from the airport must be pre-arranged as there are no scheduled buses or taxis on the island. Honolulu International Airport (HNL) is about a 30 mins drive from Ko’Olina. Offshore Passagemaking | Ocean Crossing | Sail Training | RYA Yachtmaster Ocean & IYT MOY Unlimited qualifying voyage: contact to discuss. 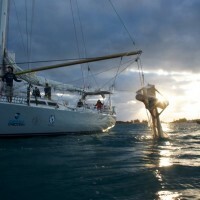 Join at Ko’Olina Marina in Oahu (1500-1700) ready to cross the North Pacific and sail right through the heart of what everyone has been talking about, the North Pacific Gyre! Find your rhythm in life at sea and the days will fade in and out upon big blue. This trip has a little bit of everything – warm & fast sailing in the tradewinds leaving Hawaii, the chance for some spectacular mid-ocean swimming under the Pacific High mid-trip, weak frontal systems approaching the coast of Canada and maybe even some fog coming down the Strait of Juan de Fuca. After more than two weeks at sea, arrive at Victoria Harbor for a night out, and disembark Sea Dragon at 0900. Connections: Honolulu International Airport (HNL) is about a 30 minute drive from Ko’Olina. There are numerous ferries from Victoria to Seattle, Vancouver, and Tsawassen. You can also travel via seaplane to Vancouver, or fly Air Canada out of Victoria International Airport, YYJ, which is about a 20 minute drive north of the city. Join at Shilshole Marina in sunny Seattle (1700-1900), and set sail at the height of the summer season, exploring Washington’s San Juan Islands while searching for Humpback and Killer Whales. Maybe even stop in Bellingham, home of skipper Shanley’s alma mater, for a wild night of bowling! Then it’s on to Vancouver, Canada’s west coast metropolis, to conclude the voyage a Coal Harbor Marina, disembarking Sea Dragon by 0900. You’ll be in the perfect spot to explore Vancouver and Stanley Park right nearby! Connections: Seattle – Tacoma International Airport (SEA) is a 30-40 minute drive south of Shilshole marina, and is also an easy train journey into the city. Vancouver International (YVR) is about 20 minutes from the marina by car, and also easily accessible by rail. August tbc | Private Expedition with Partner | 10 days, 9 nights | Check Back Soon! The details of an awesome expedition are just being finalised! Spend the first half exploring the islands and harbors of the Pacific Northwest before heading offshore for some rugged sailing down the coast of North America to San Francisco. This was an epic trip last year – stay tuned for an announcement! - Deposit is usually $500, non-refundable. - Cross-border trips require a passport with at least 6 months validity and potentially visas from your home country. - Many nationalities which can enter the US by air on the ESTA visa waiver program need a B1/B2 visa to enter by sea (likely if you are NOT from the USA, Canada, or Bermuda). - You must have appropriate paperwork completed before joining the vessel, or you will not be allowed to board. - You are responsible for ensuring that you have insurance to cover shore-based medical treatment, rescue, and medical evacuation if required. You may want to check with your provider to ensure you will be covered for offshore sailing and in international waters (if applicable to your expedition) and cover for medical emergency. - Full terms and conditions supplied upon booking.